Most of the local history collection is housed in the Middletown Room. 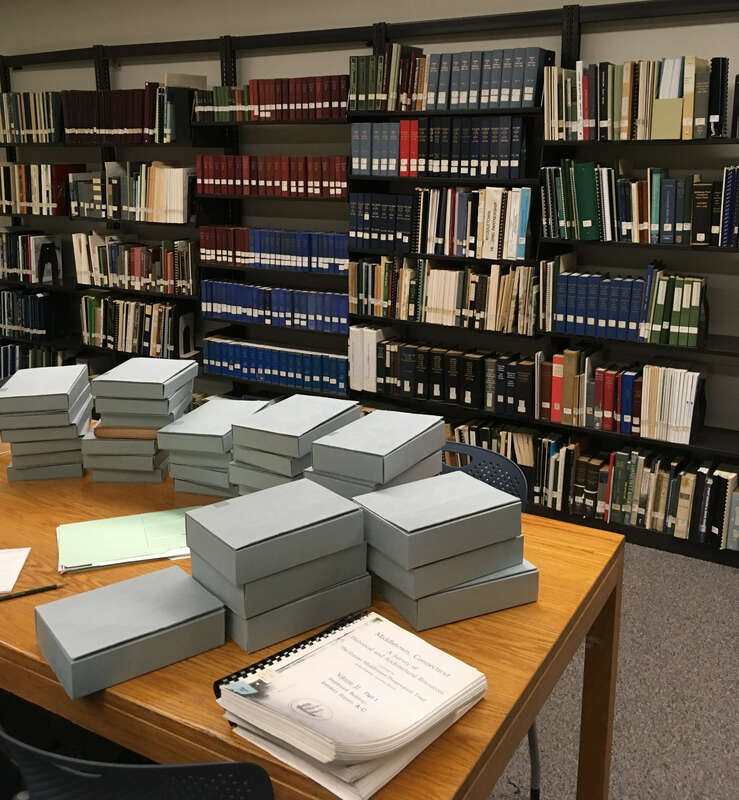 The mission of the Middletown Room is to identify, collect, organize, preserve, and provide public access to the materials that document the economic, natural, political, and social history of Middletown. See below for a complete list of materials. Resources may also be found in the reference collection and microfilm collections. Microfilm archives include Mellili church records, discontinued Middletown Newspapers, The Middletown Press, passenger lists, etc. The Middletown Room is located on the second floor. Please register to use the Middletown Room at the Information Desk. If you need help getting started or need a specific resource, please ask one of the reference librarians for assistance. You may visit and use the Middletown Room during regular library hours. The library has the working files and a printed copy of an architectural survey of homes and buildings in Middletown conducted by the Greater Middletown Preservation Trust in 1976. Published histories and surveys conducted for other towns within Middlesex County are also included in the collection. The collection includes topographical, population, town, city, and state maps. Sanborn Fire Insurance Maps of dwellings, roads, and businesses in Middletown are available for the years 1884, 1895, 1901, 1907, 1913, and 1924. The collection includes company catalogs and company histories for leading businesses in Middletown. The Biographical Record of Middlesex County and Leading Manufacturers, Merchants, and Industrial Enterprises of Hartford, New London, Windham, and Middlesex Counties in 1887 provide biographical information about local businessmen. A book of cemetery inscriptions known as the Hale Collection is available for Middletown. The cemetery headstone inscriptions were surveyed and transcribed in the 1930’s. Inscriptions for other towns in Middlesex County are included in the microfilm collection. The library has the 1790 Census of the United States in printed form. A microfilm collection of census records for towns in Middlesex County is available for the years 1790, 1800, 1810, 1820, 1830, 1840, 1850, 1860, 1870, 1880, 1900, 1910, 1920 and 1930. Name indexes to the Connecticut Census are available for the years 1800, 1810, 1820, 1830, 1840, 1850, and 1860. The collection includes histories of local churches and sermons. Transcribed copies of baptismal, marriage, and death records from 1724 to 1874 for Holy Trinity Church are available. City directories for the years 1870-1992 (with gaps) are shelved in the Middletown Room. The ephemera collection includes newspaper clippings from the Penny Press and Middletown Press, pamphlets, posters, newsletters, annual reports, and journal articles. Printed genealogies of Middlesex County families are available. The collection includes the following names, as well as many others: Hall, Hamlin, Hubbard, Lyman, Miller, Pelton, Ranney, Sage, Starr, Ward, and Wetmore. Middletown and Woodrow Wilson High School yearbooks are available for 1908 to the present (with gaps). Xavier and Vinal year books are also part of the collection. Microfilmed copies of the deeds recorded in Middletown are available for the years 1654-1907. The early deeds include vital records and a grantor/grantee index to deeds recorded from 1654 to 1855. The microfilm collection includes sermons, company catalogs, addresses, works by Middletown authors, and much more. A finding aid is available. The collection includes records of men from Connecticut who served in the following wars: War of the Rebellion, War of 1812, Mexican War, Civil War, and World War I. Regimental histories compiled during the Civil War are also in the collection. A name index to Middlesex county residents who applied for citizenship between 1844-1955 is on microfilm. Declarations of Intention and citizenship papers are not included in this collection. The National Archives and Records Administration is a repository for naturalization papers. A collection of interviews from 1976 is available on cassette. Russell Library Oral History Project is available on Cassette, CD-ROM and transcriptions (most). The collection includes over 700 postcards depicting scenes of Middletown, the Connecticut River, and Wesleyan University. Examples of the postcards in the collection are available in the Russell Library Postcard Collection Sampler. Special reports, annual reports, charters and ordinances for the City of Middletown are included in the collection. The collection includes Annual Reports of the Board of Education (1874-1959 with gaps), Annual Reports of the Director of the Connecticut Industrial School for Girls (1872-1914), and Reports of the Board of Director of Long Lane Farm (1932-1944 with gaps). The Barbour Collection of births, marriages, and deaths up to approximately 1854 for towns in Middlesex County are available on microfilm. Copies of birth records to 1868, marriage records to 1912, and death records to 1900 filed with the City of Middletown are also available on microfilm. The following indexes are available in the Information Department on the second floor of the library. Middlesex Gazette, May 1, 1790 – Mar. 20, 1834 (with gaps), weekly. Connecticut Spectator, May 20, 1814 – Dec. 28, 1814, weekly. News and Advertiser, 1851-1854, weekly. Sentinel and Witness, Sept. 25, 1869 – Dec. 27, 1884 (with gaps), weekly.